Leander Paes is a Indian professional tennis player and a former World No. 1. in Men's Doubles.Currently ranking as the worlds Number 8.He is is a magnificent tennis player.You want to know more about Leander Paes Tennis career, biography and profile then read the full article. Leander Paes born on 17 June 1973 in Kolkata . He is a professional tennis player from India.He has won several doubles titles. He awarded by Rajiv Gandhi Khel Ratna award and the "Padma Shri"( India's highest honor) . He comes from a sporting family, both parents participated in the Olympic Games in Munich in 1972. Father Vece was a hockey player & Mother Jennifer was a basketball player. 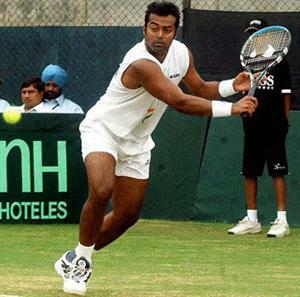 Leander Paes won the junior Wimbledon in 1990. In 1991 he started his career. He won a singles tournament series ATP Tour (Newport 1998, on grass courts, in the final of the representative of South Africa beat Neville Godwin ). Two years earlier, suddenly stood on the Olympic podium, reaching for the bronze. He was then classified beyond the first hundred of the world rankings. His medal was the first Olympic trophy for India since 1980, and in individual sports - the first since 1952 (from the success of wrestler Jadhav ). The highest ranking in singles Paes reached shortly after the success in Newport, in August 1998 and was then the 73rd spot.In doubles, won the first tournament in 1997, in Madras . Then made a couple of fellow Bhupathi. Doubles Paes / Bhupathi soon got into the forefront of the world, yet in 1997, winning five more tournaments and advancing to the Masters Cupu (in the tournament reached the finals). In 1999 the Indians were in the four Grand Slam finals, winning the competition at Wimbledon and French Open. Leander Paes reached at No. 1 ranking in 21 June 1999. Leander Paes had much success in 2003,he won both the Australian Open and Wimbledon in 2004. End of 2010 he won a total of six Grand Slam men's doubles has tournaments and six Grand Slam mixed doubles tournaments. Since 1990, Paes is a regular representative of India in the Davis Cup, both in a single and Doubles.